SOUTH CHINA SEA - – The guided-missile destroyer USS Chung-Hoon (DDG 93) is implementing a temperature control initiative with the goal of conserving energy, strengthening operational reach, making programmatic recommendations throughout the fleet and providing support at the depot level. 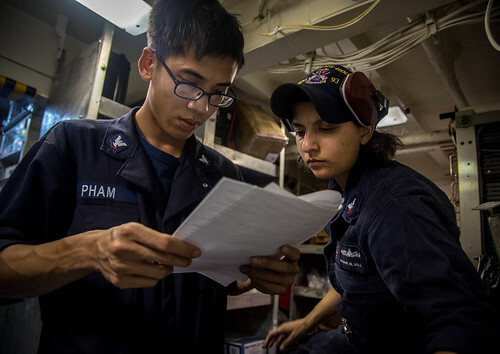 Chung-Hoon’s temperature control plan is part of the Navy’s yearlong initiative called the Great Green Fleet, highlighting efforts to transform energy use in order to increase operational capability. Arleigh Burke class destroyers like Chung-Hoon have five, 200-ton air conditioning (A/C) plants that consume approximately 15 to 20 percent of the ship’s total energy. Normal ship operations require using at least two of the A/C plants to maintain a 44- degree chill water requirement. Warmer climates such as the South China Sea and their homeport waters near Hawaii require operating at least three A/C plants. The 44-degree chill water is used to cool combat and weapons systems equipment and provide proper ventilation, with a tertiary effect of cooling spaces for the crew. Aboard Chung-Hoon, there are 186 thermostats that control the Heating, Ventilation and A/C systems with a manual analog dial. The thermostat dial setting allows the chill water based ventilation to be properly distributed to associated ship spaces. With a complicated set of systems and the number of thermostats aboard the ship, there are opportunities for significant temperature variance. In the temperature control initiative, the first step is to locate and verify divisional ownership of every thermostat. Chill water valves are often more susceptible to corrosion due to the amount of condensation that is generated in their vicinity. Sheldon added that Chung-Hoon’s initiative mirrors the Deputy Assistant Secretary of the Navy for Energy's Maritime Pre-screening Assessment of Conservation Technologies (MPACT) program and has helped influence the decision to work on developing a control centered program for the next M-PACT initiative.